Queenslanders, it could be argued, have a predilection for catchy slogans. This distinctive character has long been promoted and exploited by the State’s tourism authorities. 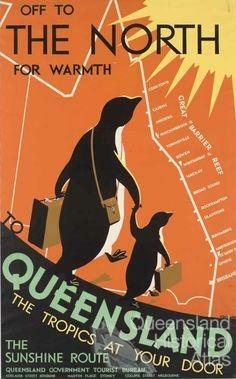 In the 1930s the Government Tourist Bureau enticed Melburnians, mid-winter, to come 'north for warmth’, and later in the 1970s it advised all-comers to ‘join the queue for Queensland’. 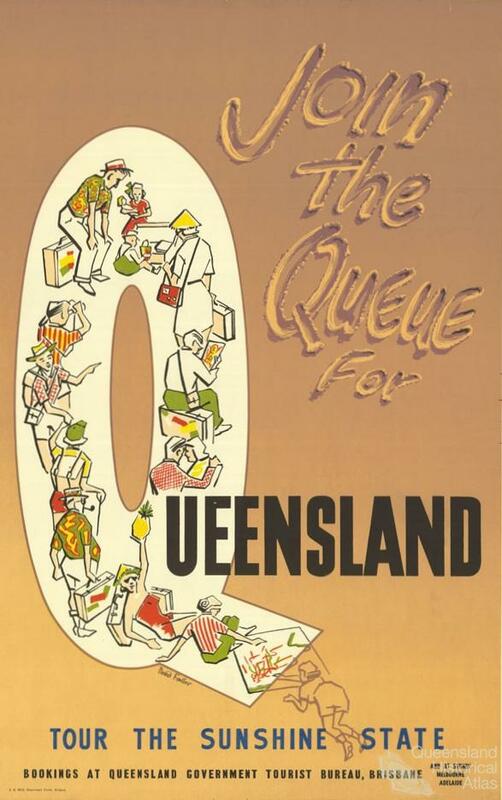 By the 1980s a renamed Queensland Tourist and Travel Corporation beckoned a new wave of interstate and international visitors with the still popular refrain, ‘Beautiful one day, perfect the next’. In the twenty-first century the State capital became the focus of Tourism Queensland’s eyebrow-raising marketing slogan that asked, ‘Brisbane, what are you up for?’ – sleazy, according to some, but perhaps not as suggestive as the South Australian Tourism Commission’s ‘SA, going all the way’. 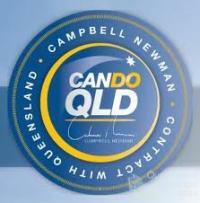 Equally, Queensland’s politicians have developed a fondness for sloganeering. Premier Peter Beattie (1998-2007), with his comfortable media presence and ear for a glib sound-bite, is the best known recent example. However, Premier William Forgan Smith (1932-42) had earlier pioneered the use of radio broadcasts and adopted catch-phrases. In a political first, Forgan Smith’s government had teamed with Brisbane radio station 4BC in 1937 to transmit State-wide a series of informal ‘talks’ with the Premier and his Ministers, informing listeners about government achievements of ‘great interest and vital importance’ under the slogan of ‘Developing Queensland’. Each Minister’s on-air spot carried a tag-line, including ‘Building for the Future’ by Minister for Public Works, Harry Bruce. 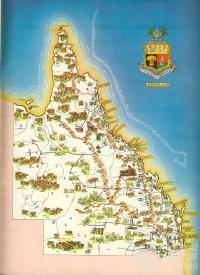 Political parties have turned the government slogan and branded campaign image into a visual art form, not least with the commissioning of a leading graphic designer (the future State governor’s spouse) to create the Beattie government’s distinctive logo, a ‘map’ of Queensland comprised of sunrays later dubbed the ‘burger and fries’. Beattie’s argument that a forward-looking government needed a modern ‘corporate’ image seemed to reflect Queenslanders’ aspirations for a renewed and more confident State identity in the post-Fitzgerald and post-Expo ‘88 climate. Similarly, and indicative of the way many residents once viewed their State, National Party election campaign posters in the mid-1980s featured an illustrated image of a beaming Premier Joh Bjelke-Petersen (1968-87), captioned simply and assuredly with ‘Joh’ and ‘Queensland’, as if the two were synonymous. 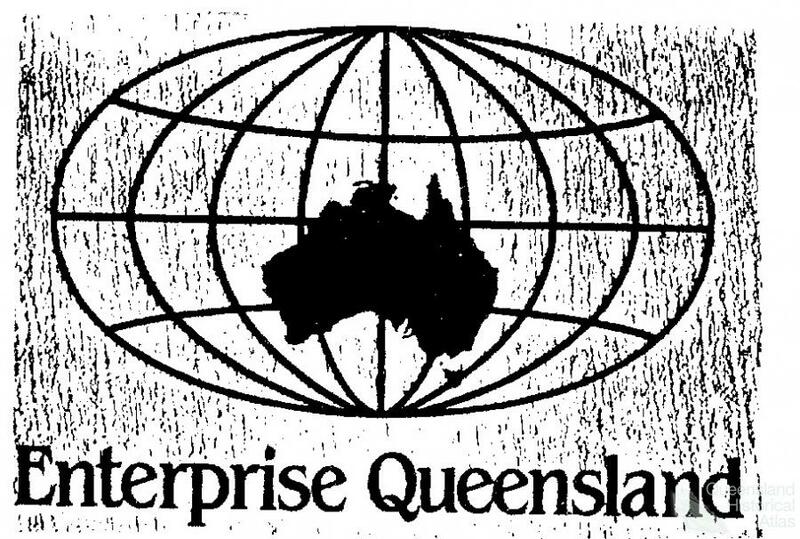 Few people reacted when the logo for the Bjelke-Petersen government’s ‘Enterprise Queensland’ economic initiative portrayed a map of Australia on a stylised globe, as if Queensland and the nation were one and the same. Bjelke-Petersen had resurrected an old Labor Party slogan, ‘Queensland Unlimited’ – the radio broadcast tag-line used by Forgan Smith’s Minister for Transport, John Dash – as the title for his five-minute promotional television program beamed into the State’s living rooms on Sunday evenings before 6pm news bulletins. With this recycling of a 1930s, pre-television-era slogan, and borrowing heavily from Forgan Smith’s example, the marriage of widespread visual medium and an ever-present Premier’s image was complete. While Joh’s ‘Queensland Unlimited’ became a byword recognised around the nation for excessive government self-promotion, the program’s cosy style and subtle sloganeering helped further entrench the National Party in office. The show also helped embed another of Bjelke-Petersen’s oft-used slogans in the public consciousness, reinforcing the message, derived from the 1959 State centenary anthem, that ‘life is great in the Sunshine State’. 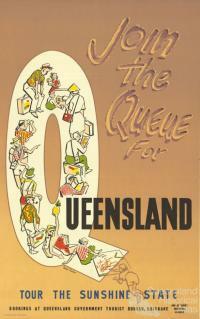 The television program lasted beyond Bjelke-Petersen’s demise into the premiership of his successor, Premier Mike Ahern (1987-89), when it was relabelled ‘Queensland 2000’ with an obvious nod to Ahern’s technology-focused government agenda – ‘Quality Queensland’. National Party Premier Rob Borbidge (1996-98) amended this media approach when his government produced an annual newspaper lift-out section titled ‘Your Queensland’. In it, the government laid out its achievements and service delivery record over the preceding year. 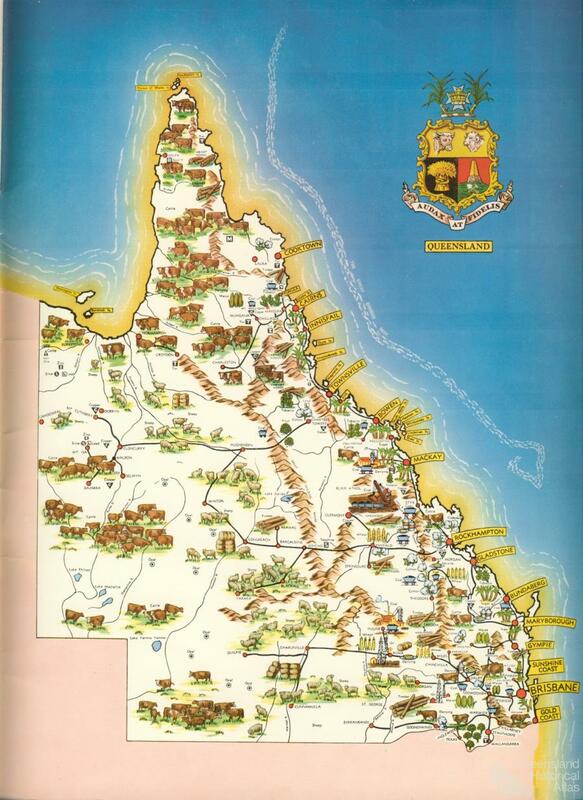 Premier Wayne Goss’ (1989-96) branding of Queensland as the ‘leading state’, a message reinforced in a much less colourful economic policy ‘blueprint’ published by the government, laid out plans for government action in years ahead rather than a snapshot of the year just passed. No matter how the messages were packaged, Queenslanders by then were used to their political leaders’ habit of spruiking the State via slick slogans and strategic branding. The pinnacle of modern government sloganeering, though, arrived with the promotion of Peter Beattie’s ‘Smart State’ strategy from the late 1990s onwards. Although derided at home by many, Beattie believed – and ultimately was proved right – that the snappy slogan would be accepted and embraced, most importantly by foreign and corporate investors willing to ‘buy into’ the premier’s positive and expansive vision for the State’s development. Queensland’s reputation as a State of ‘can do’ entrepreneurs – more lately refashioned into something akin to ‘Newmanism’ – and unrivalled investor appeal owes much to the efforts of State governments through such promotional campaigns. 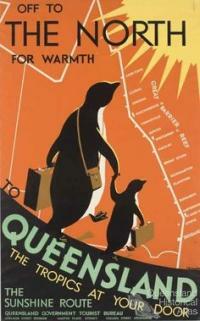 The idea of Queensland as a ‘smart’ State at first seemed little more than a brash, tongue-in-cheek marketing ploy. In 2001, buoyed by his landslide electoral victory, Beattie planned to alter the slogan on motorists’ licence plates to read ‘Queensland – The Smart State’ instead of the usual ‘Sunshine State’. While other States have altered their licence plates from time to time with little fuss – New South Wales from the grandiose ‘Premier State’ to self-evident ‘First State’, Victoria from ‘Garden State’ to the debatable ‘The Place to Be’, or Western Australia feverishly adopting ‘State of Excitement’ in the 1980s – Beattie seemed to underestimate his constituents’ aversion to the change. The public outcry, fed by an overtly critical Brisbane Courier-Mail and other Murdoch-owned papers throughout the State, led to a prompt reversal of policy so that motorists had a choice between the two versions. The slogan, though, quickly became the Premier’s mantra, and Beattie’s repeating the slogan ad nauseam was echoed by Cabinet Ministers keen to ride on the coat-tails of an increasingly popular Premier. ‘Smart State’ was another means of ‘selling’ Queensland, much as State governments had done in decades past through tourism slogans and industry expositions. The success of the ‘Smart State’ agenda probably represents the height of government sloganeering, at least as influential as ‘Sunshine State’ before it. Through his ‘Smart State’ agenda, eye-catching in its support for scientific research and an emerging biotechnology industry, Beattie also refashioned Bjelke-Petersen’s brand of Queensland ‘particularism’ into something more like Queensland ‘exceptionalism’, boosting the State’s image and confidence at the same time. As a recipe for political and electoral success, it was hard to beat. In the same period, the best that other governments could offer by way of vision statements was the ‘New South Wales State Plan’ or the ‘Canberra Plan’. Premier Anna Bligh’s (2007-12) ‘Tomorrow’s Queensland’ (or ‘Q2’) strategy attempted to trump ‘Smart State’, but ambiguity and ineffective marketing meant that the slogan failed to elicit public enthusiasm, condemnation or even recognition. 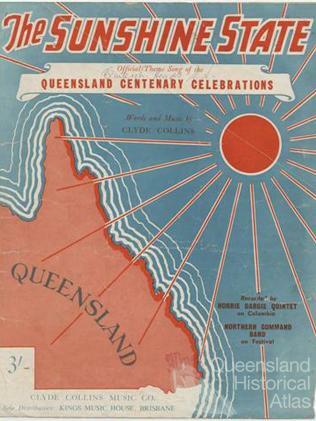 While ‘Sunshine State’ took a back seat during this period, Beattie still had his own ‘Where else but Queensland?’ and the long-lived ‘Beautiful one day, perfect the next’ tourism slogans to continue tempting holiday-makers and retirees over Queensland’s border. 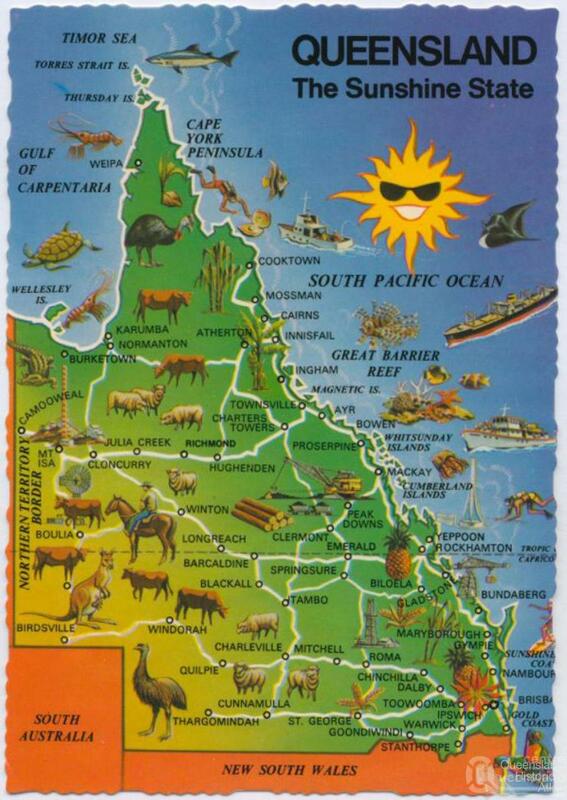 While Bligh jettisoned Beattie’s signature tourism marketing slogan, replacing it in 2010 with ‘Queensland, where Australia shines’, the message and imagery of Queensland’s exceptionality remained the same. Still, Bligh’s slogan provided a ready platform to assert Queensland’s resilience in the face of unprecedented flooding and cyclonic disasters in the summers of 2010 and 2011, when it was refashioned to the stoic ‘nothing beats Queensland’. Beattie’s ‘Smart State’ slogan had been used informally by members of the earlier Goss government, spruiking Queensland’s emerging IT industry, as well as by the Kennett Victorian government in the mid-1990s. 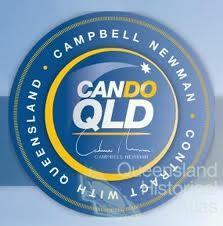 Campbell Newman trumpeted his Liberal National Party (LNP) as the ‘can do’ team – led by ‘can do Campbell’ – in the run-in to the 2012 State election, despite Beattie having earlier branded his own administration as a ‘can do government’. When it comes to sloganeering, there’s little new under the Queensland sun. When Newman’s LNP swept to office in a resounding victory at the 2012 State election, among the many expected changes was the expulsion of the previous government’s slogans and ‘brands’. The new government quickly jettisoned all mention of ‘Smart State’ or ‘Q2’ – such is the fate of branded strategies that have outlived their usefulness – and soon began replacing the government logo with its own version. In ditching the Beattie/Bligh logo of the map of Queensland overlain with rays of sun, the incoming LNP government reverted to a traditional colonial-era coat of arms logo, albeit one that had been changed a little over time, which had graced generations of government publications and letterheads. The ‘new’ logo was introduced via the government’s online presence; intriguingly, the image is almost indecipherable when used on government web pages. Despite all of this, the Beattie-era symbolism persisted in a real and physical sense in the landscape, its entire removal presumably too costly to justify, from signage at sporting fields and hospital wards to government-sponsored websites and even the government’s own Executive Building. Newman’s administration did, however, establish its own slogan – ‘Great state. 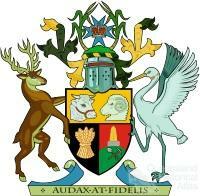 Great opportunity.’ – the first government slogan not to feature the State’s name. Whether ‘Great state’, like ‘Smart State’, earns its own registered trademark and becomes the accepted by-word for the Newman government’s program remains to be seen.